I adopted Zeek from friends who couldn't take care of him anymore. I was hesitant to take him since he was older, but my heart wanted him. He was always very calm. Never one for toys. Not your typical fuzzy. He enjoyed following me around and finding cozy places to sleep. He seemed like such a wise owl. I felt bad for him because he had rotten teeth, but it never seemed to affect his eating. His favorite thing to do was to steal my dogs kibble and eat it under my bed. He started to lose his hair so I knew he had adrenal disease. I took him to the vet and we started Lupron shots. Within a couple months he started having seizures so we knew he had insulin problems. He never showed he was suffering. One night I came home and he wasn't the same. I could see in his eyes he was done fighting. He kept trying to hide like he didn't want me to see him hurt. I made the painful decision to put him down. 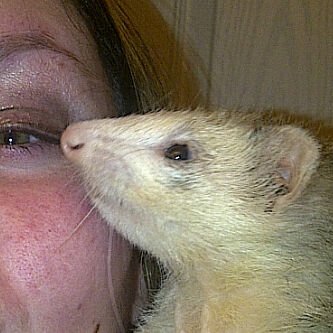 When I went to the emergency vet she made me feel terrible that I didn't want to spend the thousands of dollars for multiple surgeries on the old little ferret that may or may not help him. She made me feel like a horrible person. That was a week ago, and I'm still upset. She may not have agreed but I knew it was the right thing. I could see in his eyes he wanted to go. I only had him for a year, but he was my little buddy. I hate coming home and not seeing him here. I loved him so much. I hope he's in a better place. Tracy, I'm sure you made the right decision for Ezekial. You lived with him day after day and you knew him better than any vet. It's not fair of the emergency vet to make you feel like you didn't care enough about him, simply because you didn't want to put little Zeek through surgery. I wish you a lot of strength and rest assured that Zeek is playing happily with all the other ferrets over the rainbow bridge. It takes a lot of courage to make the selfless decision of putting the little one we love to sleep... I can tell you one thing, I have been through it and, as a daily companion you can see it in their eyes. My little one (who left me last may and I still miss every single day) almost died when she was younger... the vets could not find at first what was wrong and at some point I found myself in the complete opposite position than you, they felt it was time for me to consider putting her to sleep (they felt I was being cruel)... while I wanted to keep fighting (seems hard to gauge whether we are doing too much and putting our loved one through unnecessary pain). Fortunately, on the last test I had given myself as a deadline they found a hint and figured out the problem. She went through surgery and we had a few more years of fun. Alas, adrenal disease and insulinoma is a completely different beast... which eventually crossed our paths as well... I can tell you one thing, I tried everything that was possible and she had a good quality of life but all of a sudden she got paralyzed on back legs and there was nothing to be done... the vet assured me she was not suffering but that it was just a matter of time... I took her home with a thousand thoughts... my boyfriend was out on business trip... I knew this was no quality of life for her... but needed to have a proper moment with her and be at peace with such tough decision... decided we would do it when my boyfriend would come back... until something changed and she told me the very next day... there was no time to wait... and it became a painful yet very easy decision... I called the vet who was amazing and extremely compassionate and told me that no better person than me could tell. I feel your pain, be grateful for all the amazing moments you had and for having had the chance to experience such an amazing creature. All my love to you and Ezakiel wherever he is painfree. I wish I had the opportunity to meet the little fighter. I know you made the right decision, and nobody knows your pet like you do. I love you, and I will always be here for you if you need a shoulder to cry on!